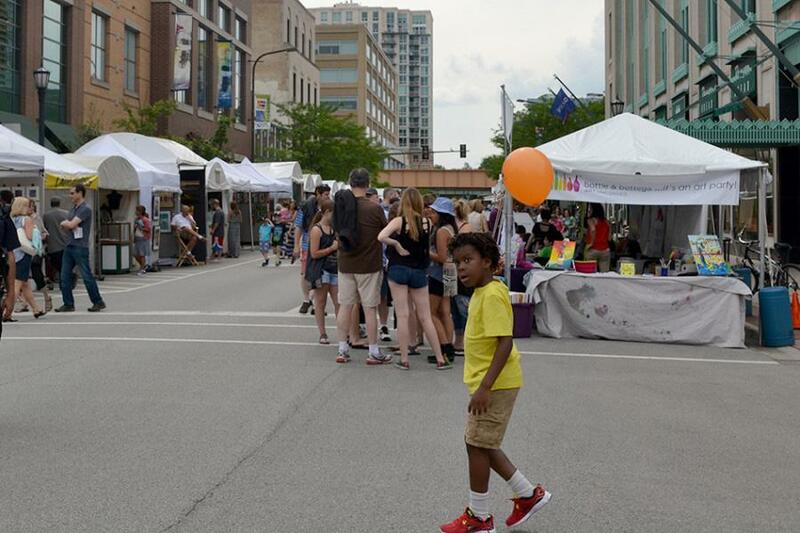 Downtown Evanston hosts an art festival in June. City Council will consider expanding the downtown region to include Foster Street. Aldermen discussed expanding Evanston’s downtown area to include Foster Street in an effort to promote commercial activity and develop building standards in that region. The proposal would create a designated area between Emerson Street to the south — where the downtown area currently ends — and Foster Street to the north, with Sherman and Ridge avenues to the east and west. This proposed subarea could function as a transitional downtown space between the more commercial area south of Emerson Street and the more residential area to the north of the street. Aldermen talked about the plan during the Planning and Development Committee meeting Monday night, and the full council will consider it at a later meeting. The Downtown Evanston Plan, which was adopted in 2009, identified 13 subareas within the general downtown and recommended the city continue fostering economic activity in the downtown area, as well as establish guidelines for building development. City officials said they have often received proposals for developments in the proposed subarea but have had issues fitting in developers’ plans with the area’s zoning restrictions. Designating the proposed area as a downtown subarea would allow for increased development. This, along with an increase in both El ridership at the Foster station and the number of renters, non-car owners and non-family households, prompted the proposal to extend the downtown area. Factors left unaddressed in the 2009 proposal, such as graduate-student housing building Engelhart Hall, a Northwestern-owned parking lot and the increase in CTA ridership, will be considered in the new proposal, city manager Wally Bobkiewicz said. Ald. Judy Fiske (1st), whose ward partially encompasses the proposed downtown subarea, said the zoning in the area needs to be addressed with community input. Fiske also said she would focus on the area between Sherman and Maple avenues and Foster and Emerson streets, which includes Engelhart, 1915 Maple Ave., and nursing home Symphony of Evanston, 820 Foster St. The area also included the proposed site at 831 Emerson St., a student-focused housing project that was rejected earlier this year. Fiske told The Daily the debate over 831 Emerson St. brought the area to her attention, and she wanted to help create a new vision for the residents living there. “It’s time for us to have a conversation about this block,” she said during the meeting. Aldermen also discussed the advantage of creating a plan before further development was proposed. The area is clearly a “hotspot” for development, and communication with NU officials would be essential, Ald. Melissa Wynne (3rd) said. “Let’s let Northwestern know what we’d like to see there and have them work with us, rather than get into an argument or a battle,” Wynne said. “This is an area that we need to shape, because if we don’t shape it we’re going to end up reacting to whatever somebody else wants to come in and tell us to do. City officials plan to hold several community meetings about the extension and will likely have a more definite plan for the council in July.